In fifty two years of driving, I have had five accidents. Four of these were somebody running into the back of my car at a traffic light or at a roundabout. My experience is supported by data that nearly 25% accidents are rear-end collisions and short separation between vehicles is the cause. Why do we pack closely at traffic lights? - waiting to accelerate away when the lights turn green? Everybody does it and it is considered more time-efficient. But is it so? 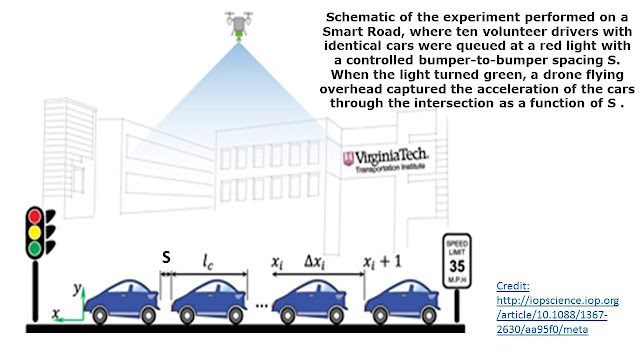 A recent study at Virginia Tech. by Ahmadi et al. 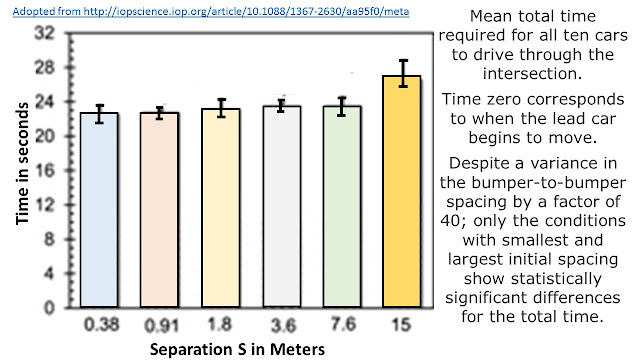 conclusively shows that short separation distances at traffic lights do not save time and may serve only to increase the number of rear-end collisions. They find that the separation that cars maintain during free flow - the 2 seconds rule - is a good guide for separation distances (S meters) at traffic lights. Separations up to about 8 m do not impact on travel efficiency in a 30 mph zone. 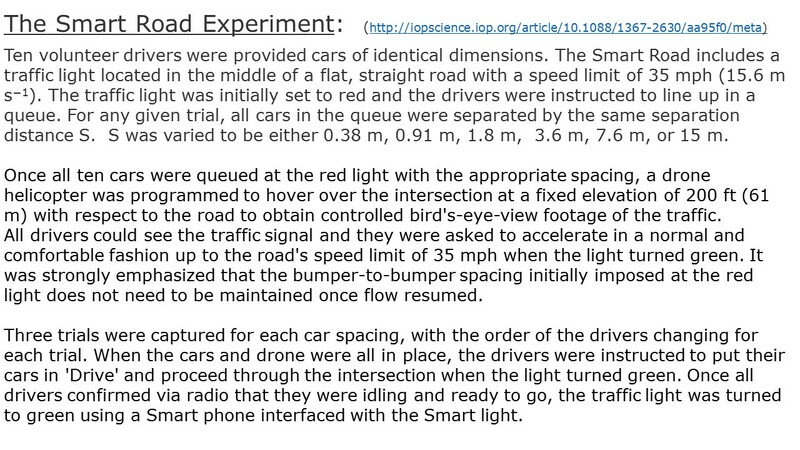 We notice, for smaller separations cars in the queue take longer before start to accelerate - for example, for S = 0.38 m, the fourth car in the queue is not moving even after 6 seconds from when the first car began to accelerate (light going green). This is because a car would start to move (accelerate) only when the car in front has moved to a safe separation appropriate to a free flow driving (remember the 2-second rule). 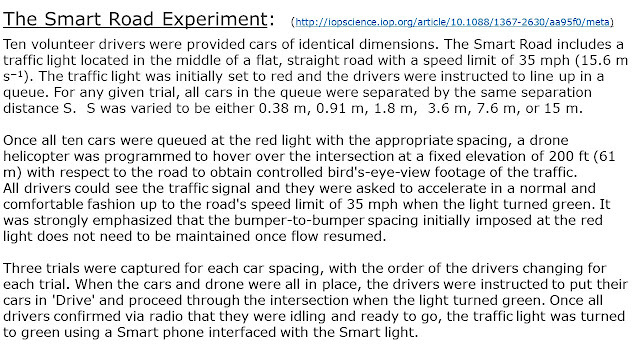 In contrast, when S = 7.6 m, even the fifth car is able to move within the initial 6 seconds. 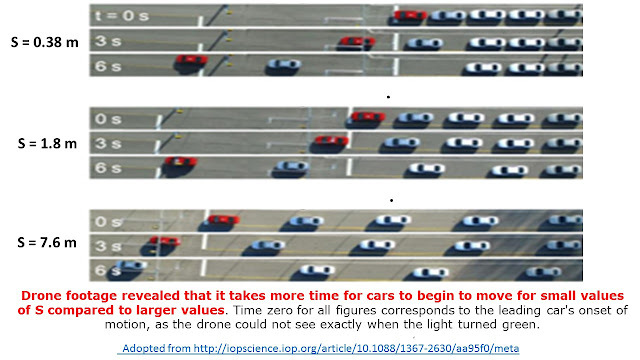 Notice; independent of the bumper-to-bumper distances from 0.38 m to 7.6 m, the time for all the ten cars to cross the intersection was constant to within 1 second at 23 seconds. Only for S = 15 m, where the separation is comparable to the minimum distance for comfortable driving, the time increased to 27 +- 3 second. It would seem that keeping a larger separation in stop-go driving conditions does not impact on travel time and is much safer. Drivers should be made aware of this observation and encouraged to follow the conclusions. I might have saved my time spent in pursuing four insurance claims which thankfully settled in my favour. The study explains these experimental observations using a theoretical model and I encourage you to visit their publication for details. I wish to thank Professor Jonathan Boreyko (BEAM, Virginia Tech.) for his kind permission to use some of the material from the study. 70 mph S = 62 m; 50 mph S = 44 m; 30 mph S = 26 m and 20 mph S = 17 m.
Considering that the reaction time of the driver might be of the order of 1 second (she may be tired too), the 2 seconds rule over-estimates the recommended separations by a factor of may be two for 20 or 30 mph zones.